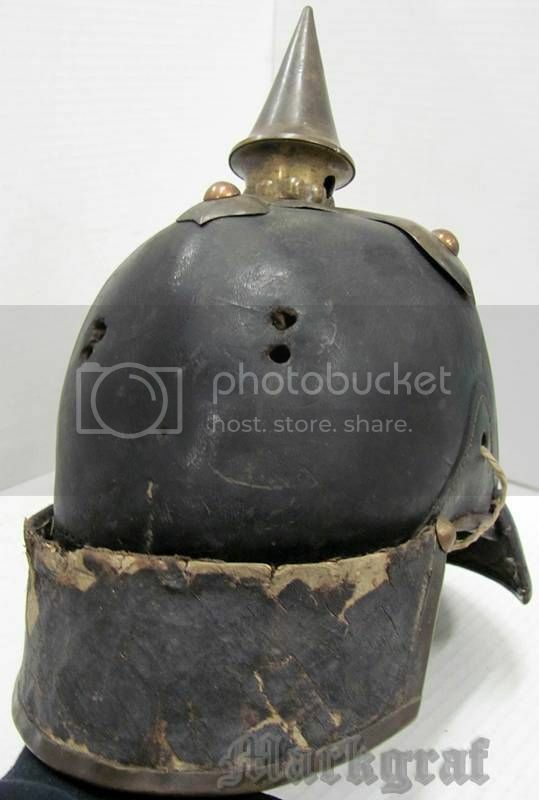 A partially disintegrated M 1860 Pickelhaube. Sadly the rosettes, the cockades and the screws of the chinstrap are lost. How can I get to spare parts (repro)? What does it mean the first three characters? 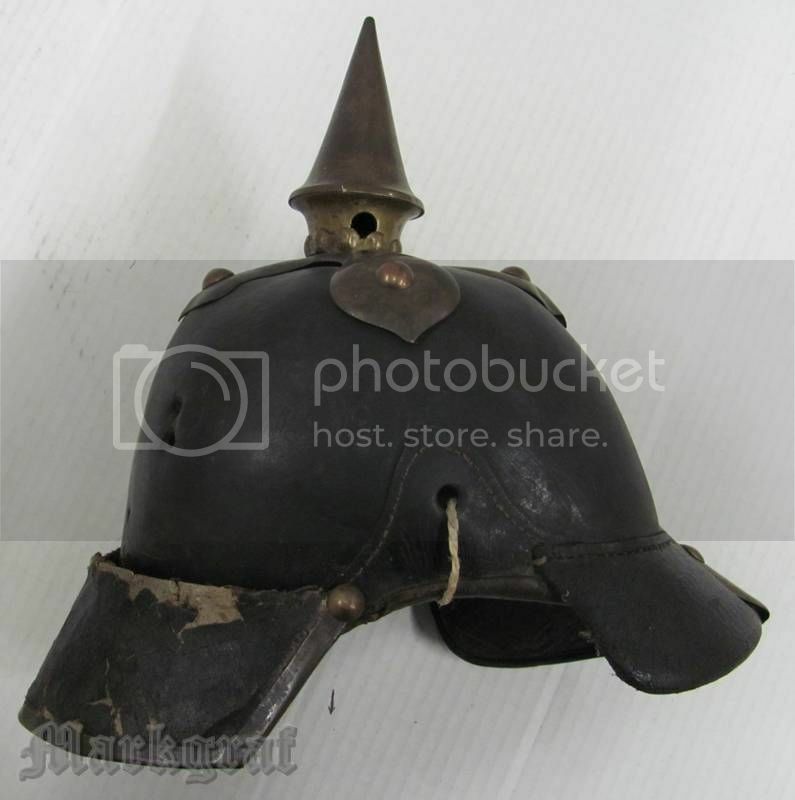 Markgraf, what a wonderful old helmet! IMO You don't need too much to put humpity-dumpity back together here, I'll look through my box of spares to see what I have available. 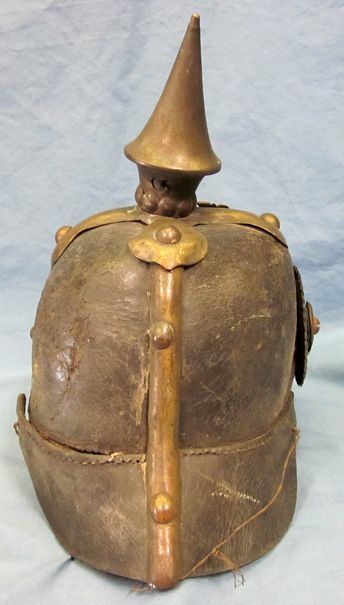 IMO this is a really early helmet predating the 1860 model, a modified 1842 with changes to 1857 with the applied bandeau. You couldn't ask for better unit markings, 3rd Pommeranian Infantry Regiment Number 14. , I believe the letter B (at least that is what it appears to be to me)which begins the unit marking, indicates Battalion, with the roman numeral which should be in front of the B missing. That's a good question I think it stands for 33 Prussian Infantry Regiment. This is an East Prussian unit and we need to look up where it was at before Gumbinnen. I am not so sure about the letter N also. I think you are right. That makes so much more sense. I also wonder about the front visor's composition, not that it's wrong, but it looks interesting. If it is cardboard, then perhaps it wasn't the military who replaced a damaged front visor (bullet hole, cut up, smashed, worn out), but a former owner who lacquered it with some care... another part of its history. It's obviously had a varied and interesting past. It could have gone from the military to a veteran's club, restaurant as a decorator or collector. Who knows? Interesting piece and good find! You couldn't ask for better unit markings, 3rd Pommeranian Infantry Regiment Number 14. I didn't even read that Larry! Too early in the morning. Okay okay so can I copy the marking and put it on the listing? It is a really good one. Talk about too early Joe, my eyeballs about popped out of my head when I saw Markgraf's helmet. I had to edit my post three times before it sounded quasi-intelligent..and I'm still not so sure about that..
Hey Francis, great minds think alike...er,ah, ah or something like that, or, we were both just so taken with the helm we were too excited to think clearly..
Ok, here's my quasi-intelligent guesstimation explanation of why the B is all out front and lonely. 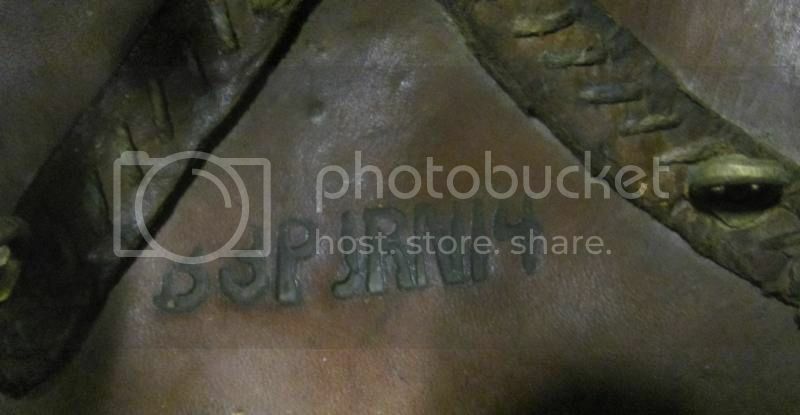 I believe this marking was branded into the helmet using one or two red-hot irons or brands first. 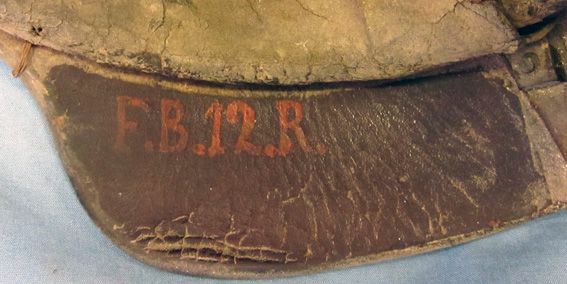 Since B3PJRN14 would have been the same marking for every helmet in the regiment. the only variables would have been the battalion marking I, II or III which would have been individually applied. Whoever marked this helmet didn't leave enough room to the left of the B to place the battalion marking. Sort of like a "Dammit" moment on Monday morning. 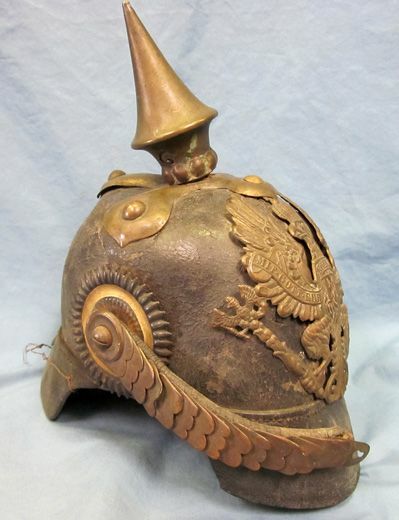 This is certainly a nice helmet with a lot of character and a nice piece of history above all. Thank you very much for the lot of comments and the informations! 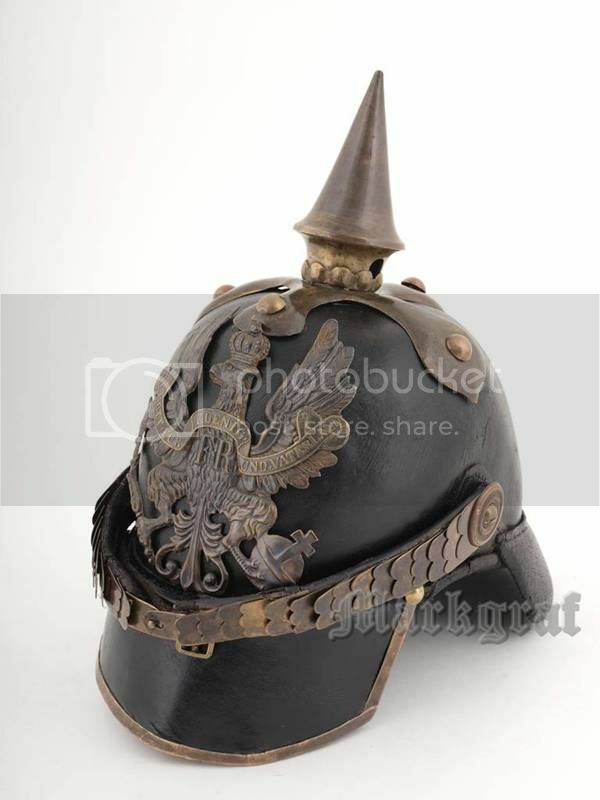 In fact this helmet is in the posession of the Hungarian Military Museum. Sadly we don't have informations about the origin because great part of the museum's archives were destroyed during the WWII. 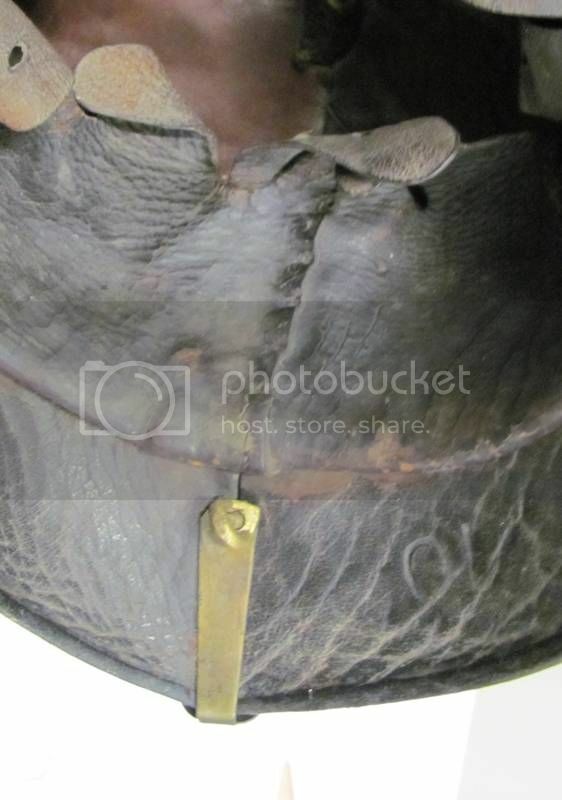 Most likely the museum acquired the helmet in the twenties (together with a number of Kaiserreich militaria). The edge of the front visor made from brass. I can't say anything about the front visor: actually made from cardboard. Might be an interwar period museum replacement but I'm not sure. The Wappen, the bandeau is clearly an overlaying part. an I copy the marking and put it on the listing? It is a really good one. joerookery: You can put the marking to your list but please note the museum under the picture. I'll look through my box of spares to see what I have available. Larmo: It would be great! Thanks in advance! 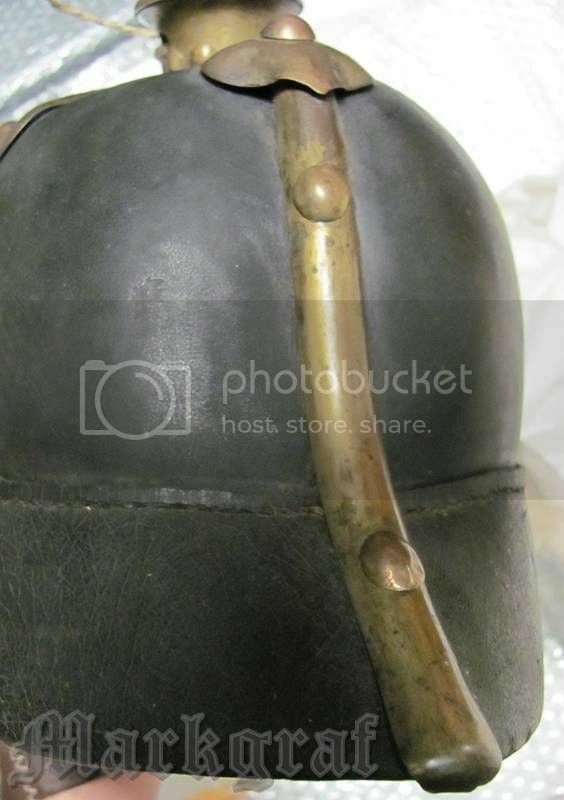 Great to see the leather reinforcement strips in the shell with the Bügelmuttern (the nuts). 1-How is the Vaterlandbandeau attached to the Wappen ? Soldered ? is it held by bolts (the hole...) ? Not by soldered-on threaded rods...? 3-How do the bolt heads look like. 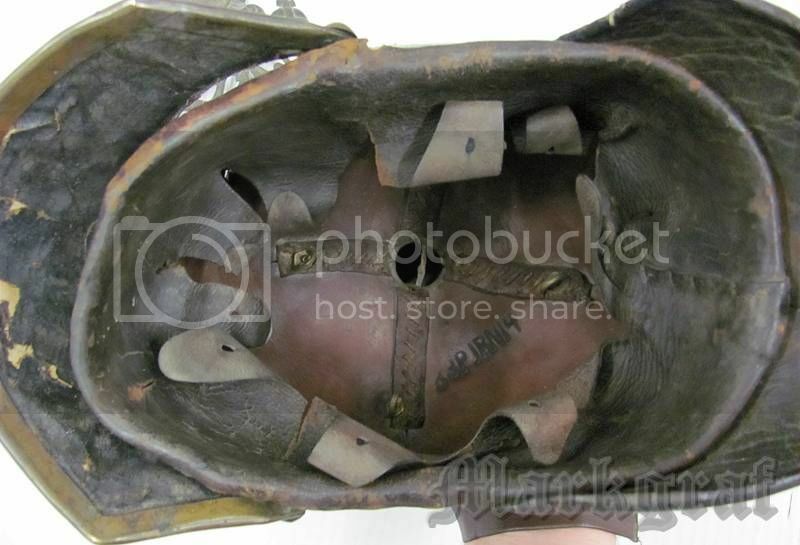 4-Can you please show pictures of the rear spine and the way this is attached to the helmets shell. (inside view on the seam in the back of the shell). I'm sure I'm not the only one who likes to see/know more. 1-How is the Vaterlandbandeau attached to the Wappen ? Vaterlandbandeau is soldered. You can see the patch of the solder. I can see a hole in the Wappen: is it held by bolts (the hole...) ? The Wappen originally held by two bolts. One of these in the hole, the other lost. 3-How do the bolt heads look like? However the bandeu nearly covered the bolt heads. 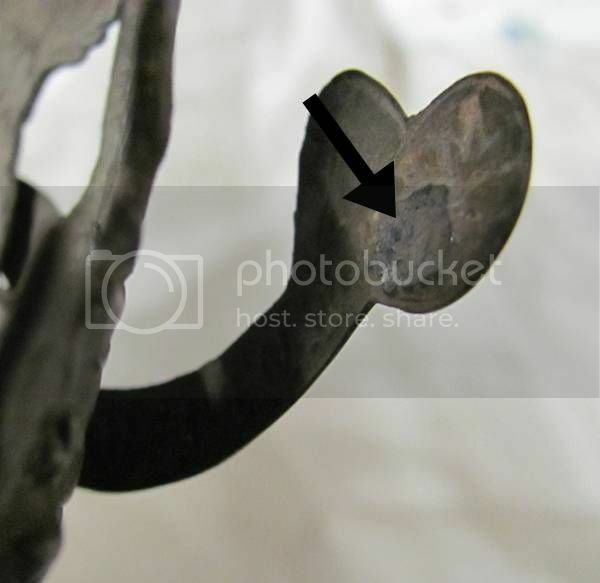 4-Can you please show pictures of the rear spine and the way this is attached to the helmets shell. I appreciate your prompt answer! 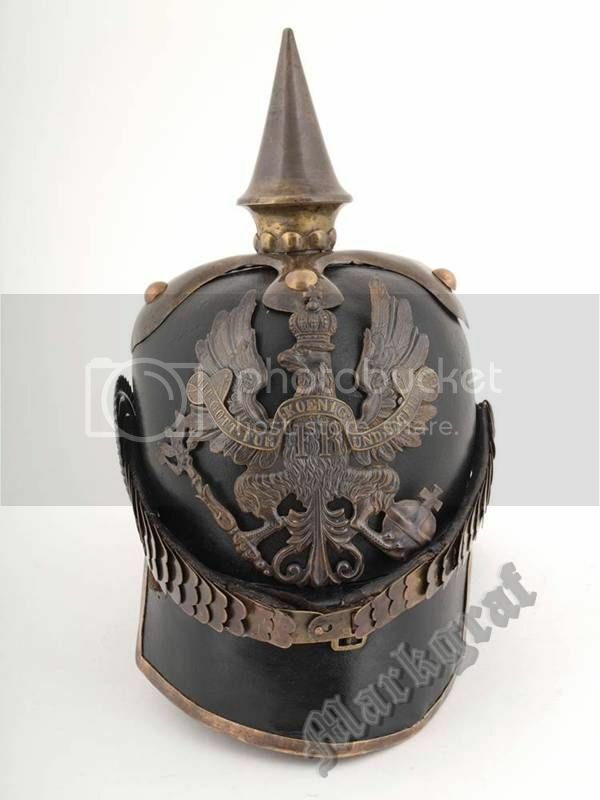 This one is a great example of several links in the Pickelhaube family tree. Prussians recycled and modified/adapted their "oldies" to the newest regulations. Still cheaper than a new Haube. So: one hell of a job for the saddle-makers. Two very important modifications that will affect both weight and height; will lead to two different patterns. 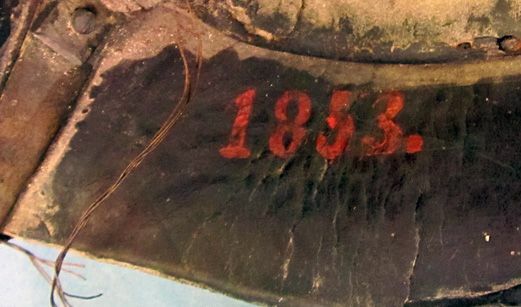 Reduction of the helmet shell by about 3 cm in 1857 means the "birth" of the Model 1857. A following reduction of the shell by 2 cm in 1860 will lead to the Model 1860. Any reduction in height on the “old” models brings important works. Full disassembly and assembly of the helmet. (from: Uniformes, Hors-série 31; Le casque à pointe). I think this one was a 1857 pattern adapted to the 1860 pattern. I would love to sniff the old brass; leather and dust ! It was a pleasure to share with You. And I received much informations. I'm searching the extra holes. So we can use the 1857/60 M designation to this helmet? Thank you, meanwhile I found the covered extra holes! Markgraf, many thanks for the additional photos…always a good thing to see and learn more. 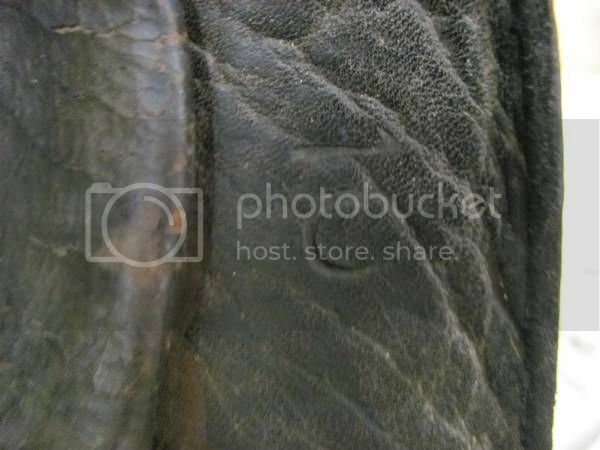 One more comment regarding this helmets markings, this time the 10C on the rear visor, likely the company number. If so, then third battalion. Somewhere on this forum is a wonderful postcard image of a display of trophies from the Battle of Koniggratz in 1866. I have looked for it but to no avail, perhaps someone else knows where it is hiding. 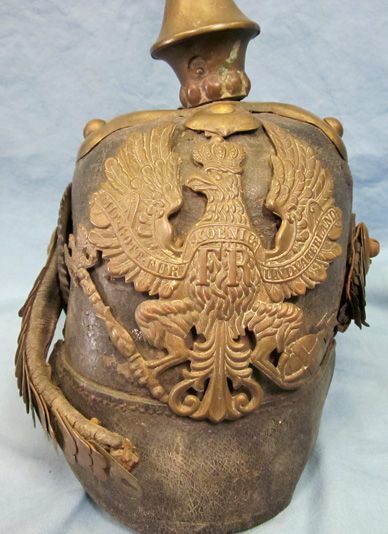 The display was fashioned to represent the Hapsburg Imperial Eagle and made from equipment and headgear including pickelhauben. Perhaps this old Grand Dad was captured during the war of 1866. A sad final note accompanying this posting was that the display was destroyed in the 1960’s and the relics burned. Markgraf please PM me your address and I will mail you the spares I have available. I admire it when people take the effort to restore a helmet to its former glory. Well done and its such a nice piece of history. Greatly improved! Thanks for sharing. Do you have a nice stand for it that will get it off of its visors for display? Hope you don’t mind this addition to Markgraf’s posting of “A Sad M 1860“. It occurred to me that in a race to the bottom sort of theme, you all might enjoy seeing this battered old soldier who recently came into our possession, condition-wise, I think ours is leading in the sad department. While the helmet appears beaten to within an inch of it’s life, it remains remarkably intact for it’s age and decades of service use and neglected storage. 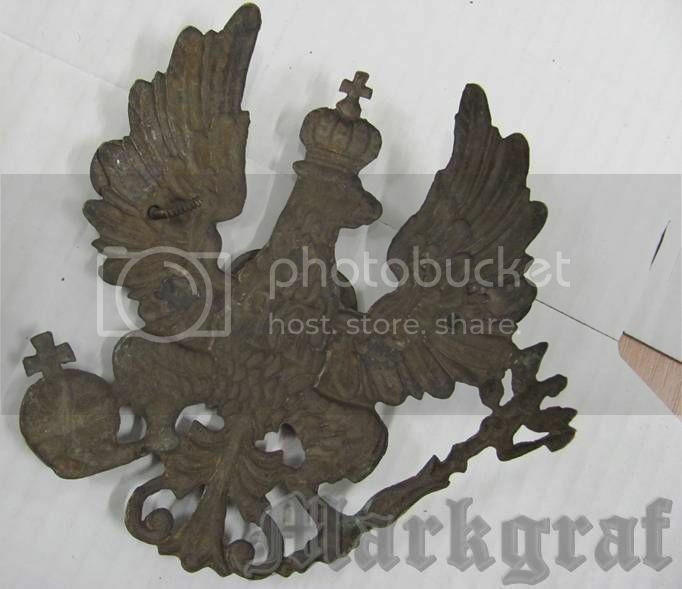 All of the brass fittings share the same color patina and amazingly it’s original, large style Prussian Kokarde has not been lost or removed. 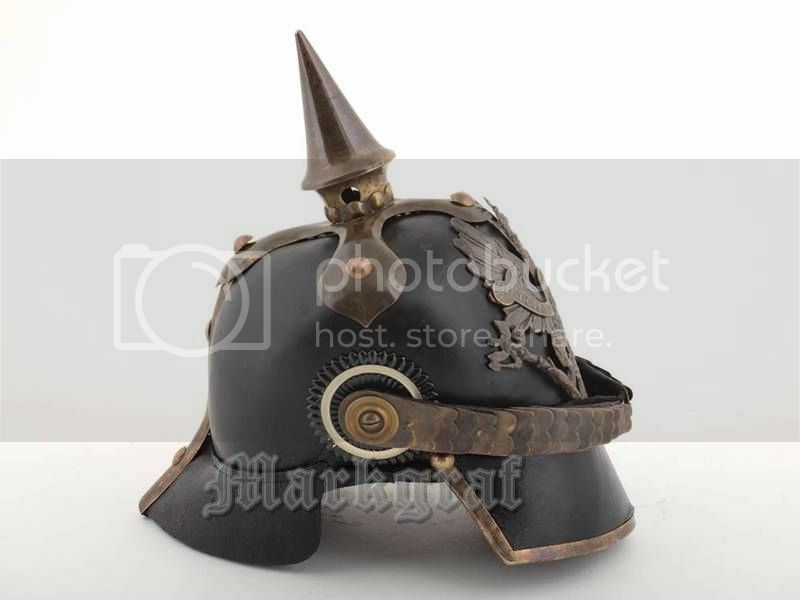 What I find most interesting about this pickelhaube are the measures taken by someone long ago to keep the spike attached to the rest of the helmet. At some point in the past the spike was broken off from it’s base and re-installed using a wooden plug jammed into it’s bottom opening. the plug was then cut across its bottom with a small wooden wedge driven into the cut to keep the plug from passing out the top of the helmet. 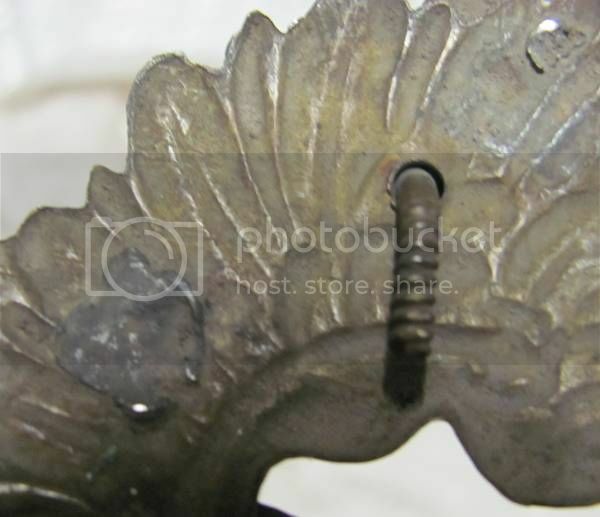 Two small steel nails were hammered through the ventilation holes in the spike base into the wooden plug, these kept the spike from twisting on the wooden plug. Quite the Fred Flintstone repair wouldn’t you say? 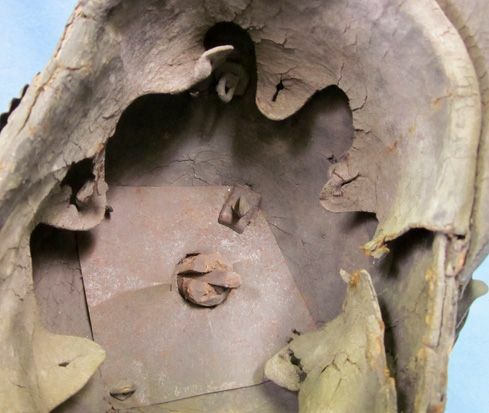 Inside the helmet a diamond shaped piece of thin sheet steel is held in place by the four stirrup nuts which hold the cruciform base in place. 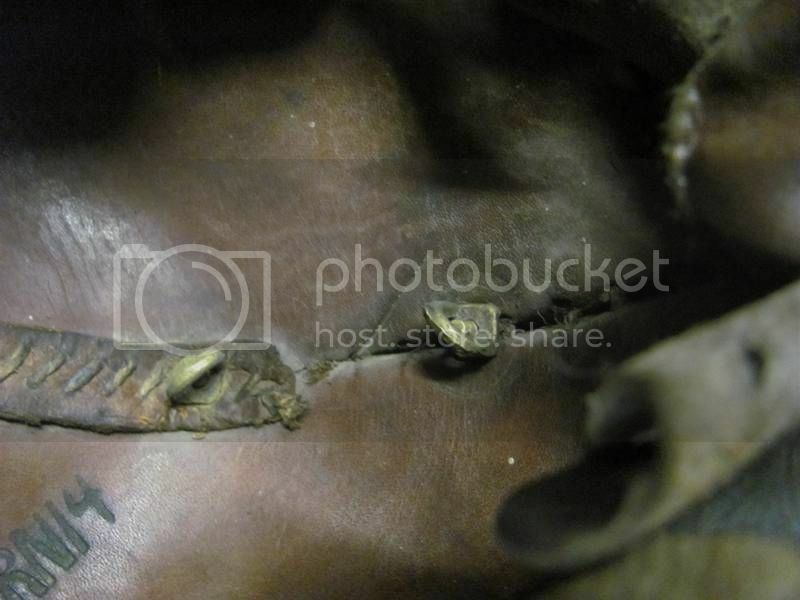 Each of these nuts has a rectangular leather washer between the nut and the steel plate. 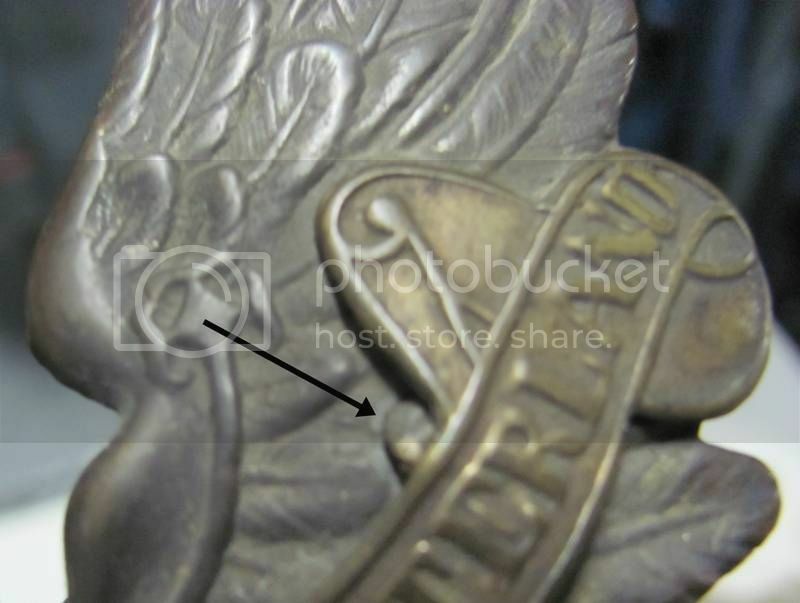 Similar stirrup nuts, and this time circular leather washers, hold the early production 1857 pattern wappen in place. 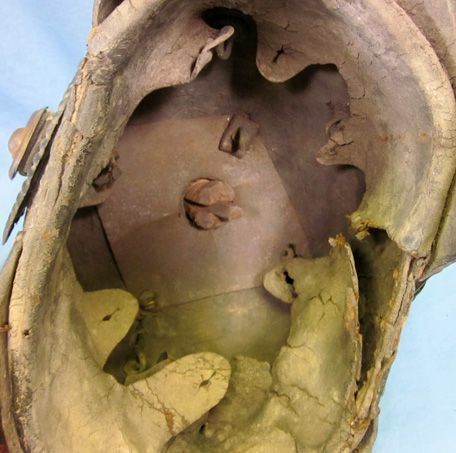 Several other holes can be seen in the body where other wappen had been in place in years past. Very clear, hand painted unit markings can be seen on the underside of the rear visor. They were nearly invisible to the naked eye until I applied a quick swab of water across their surfaces. On the viewers left side can be seen F.B.12.R., (Fusilier Battalion 12th Regiment) and on the right a date of 1853. (Joe, if these are of any use to you please feel free to add them to your data base). Lastly, I thought this might be a good opportunity to show a development transition of sorts using three different Prussian enlisted wappens. My apologies for the poor quality photographs, I should have removed the wappens from the helmets for picture taking, but I was a little concerned about applying any extra strain on this old guy. 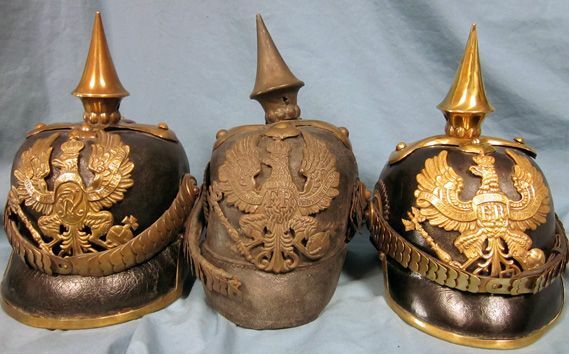 The helmet on the left I feel represents an early, cut-down pickelhaube, unit marked to the 6th Regiment with the early style wappen with upswept wings and a hand-soldered bandeau to conform to the 1857 regulations (note the Grenadier cypher instead of the FR initials), the center helmet (our old soldier again) retains the early style wappen with upswept wings but this time with a stamped bandeau (by rights this helmet should have a wappen with a Grenadier cypher), the right hand helmet shows what I would call a typical 1860 pattern wappen on a helmet unit marked to the 76th Regiment. In my opinion there are many detail variations to be seen in issue wappen of this era, these three shown here offer only a small representation. 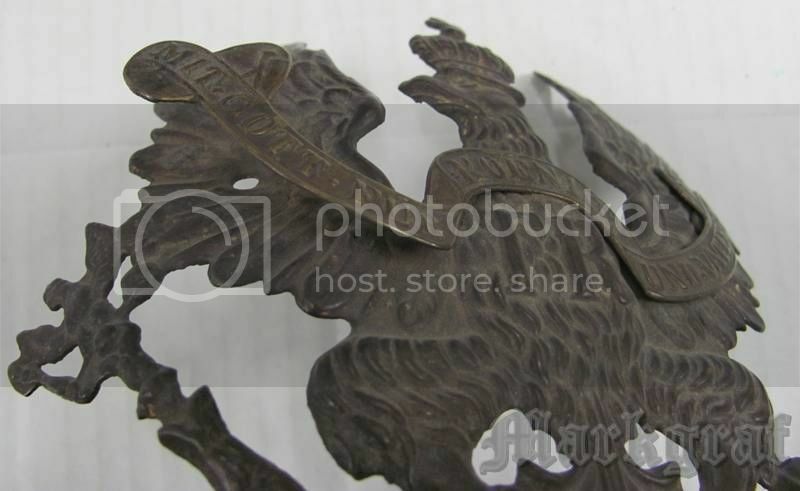 However there is one characteristic they all seem to share, the small web of brass between the top of the eagles legs and the bottom of the wings. 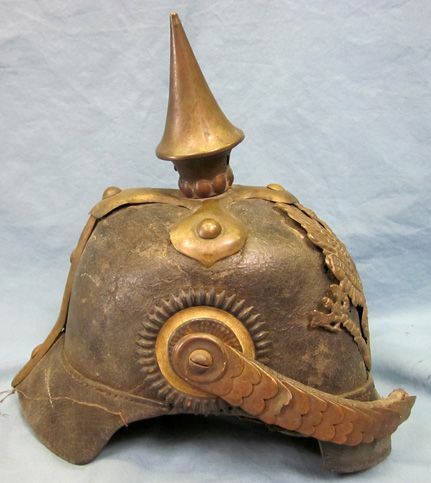 The non-pierced solid crowns seem to be typical of enlisted helmets regardless of the era. I really like those old style helmets! A nice, touching relic! Do you know where it comes from? Great advice! Thank you for the permission but I think this one might be too early for me. That water trick works frequently not all the time. 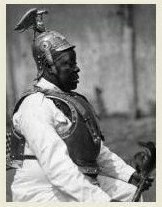 Sorry Guys, no interesting story of the helmets origins, I purchased it from southeast Pennsylvania from an EBAY store..
now he is good for 100 years more. 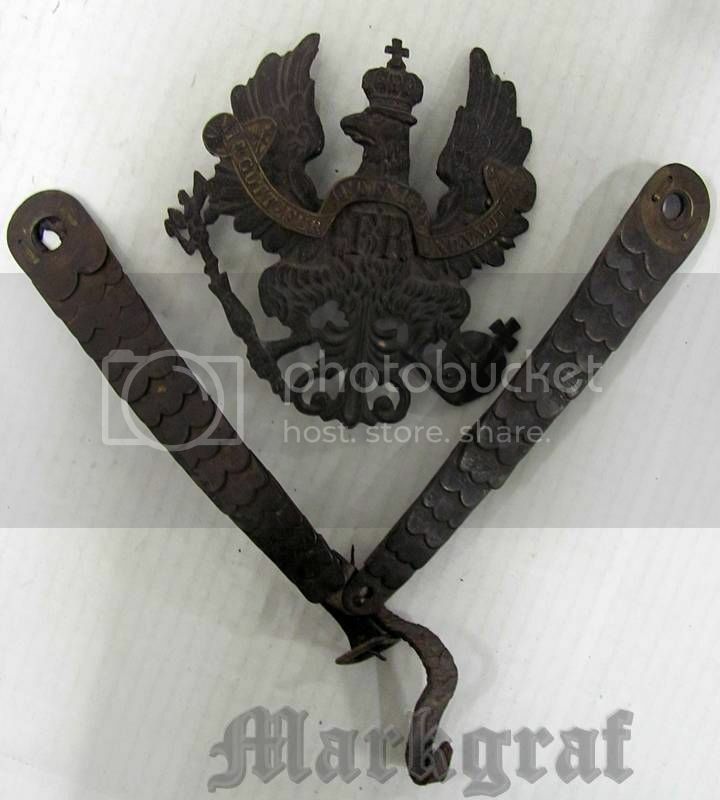 Does anyone know when the “Mit Gott Für Koenig Und Vaterland” bandeau was first used? Some say that it was instituted in 1860 while others say 1857. That is a fantastic restoration! It is great to see it come together.